Morning Pointe of Collegedale at Greenbriar Cove resident and winner of the assisted living community's inaugural senior spelling bee Mary Elam (center) poses with fellow spelling bee participants Patti Whitson, Betsy Babb, Vera Alosi, and Polly Justice. Morning Pointe of Collegedale at Greenbriar Cove hosted its first senior spelling bee. The competition allowed the residents of the assisted living community to relive fond memories from their school days while also sharpening their minds and showing off their spelling skills. Ultimately, resident Mary Elam emerged triumphant, out-spelling her competitors to claim first place. 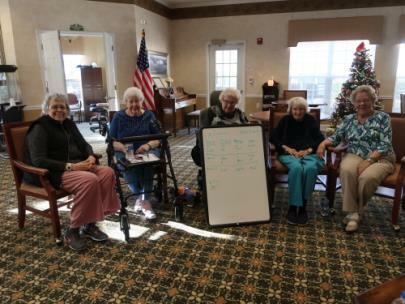 “There was much laughter, many new words learned, and an impressive amount of words spelled!” said Naomi Schumacher, the Life Enrichment director at Morning Pointe of Collegedale at Greenbriar Cove.